Well, I’ve got to take my hat off to the French: they’ve done it again. 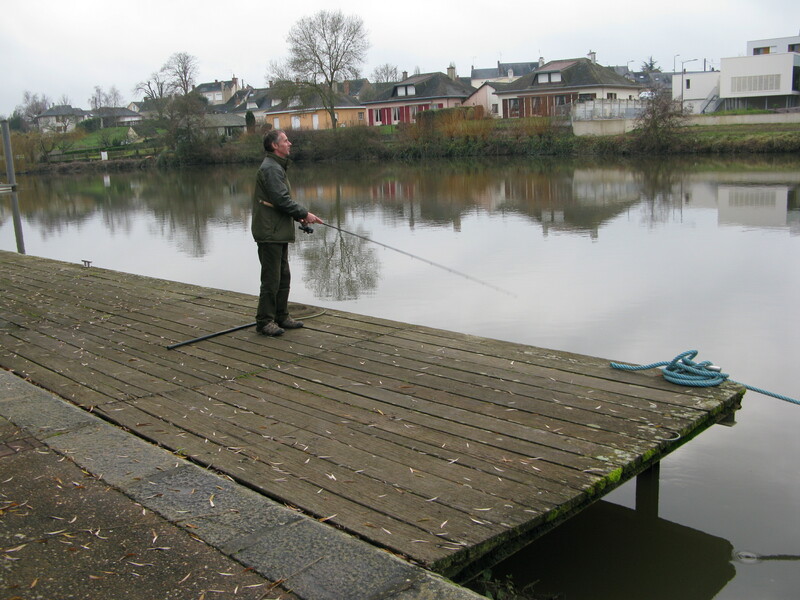 We’ve found another superb aire right on the river Sarthe, just 10 km southwest of Le Mans. We’ve already decided we want to spend a couple of days here and Adonis has bought himself a 2-day fishing permit. I definitely don’t want to move either. The aire is right next door to the campsite, which is closed this time of year, and for 3€ a day you get free water and electricity hook-up included in your parking fee. Where else but in France would you find that? 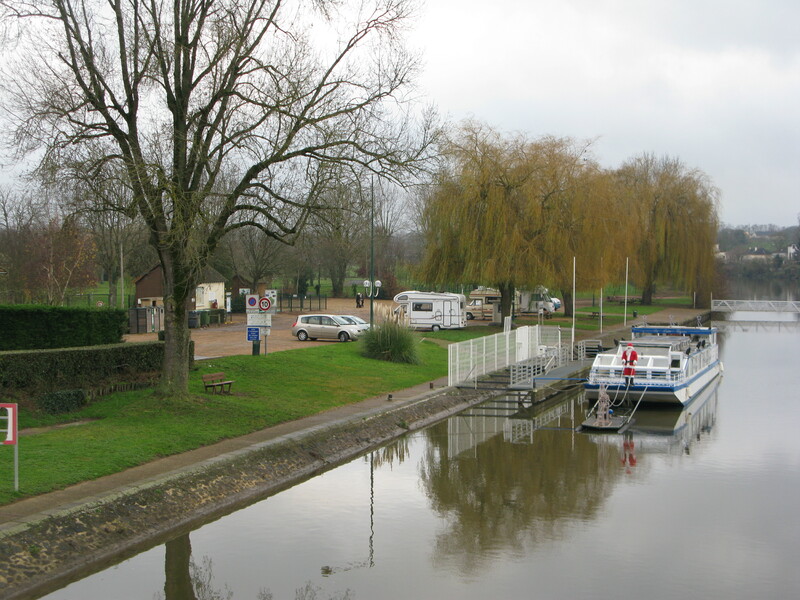 It’s got room for about 20 motorhomes, according to the aire guide, but there are only four at the moment. 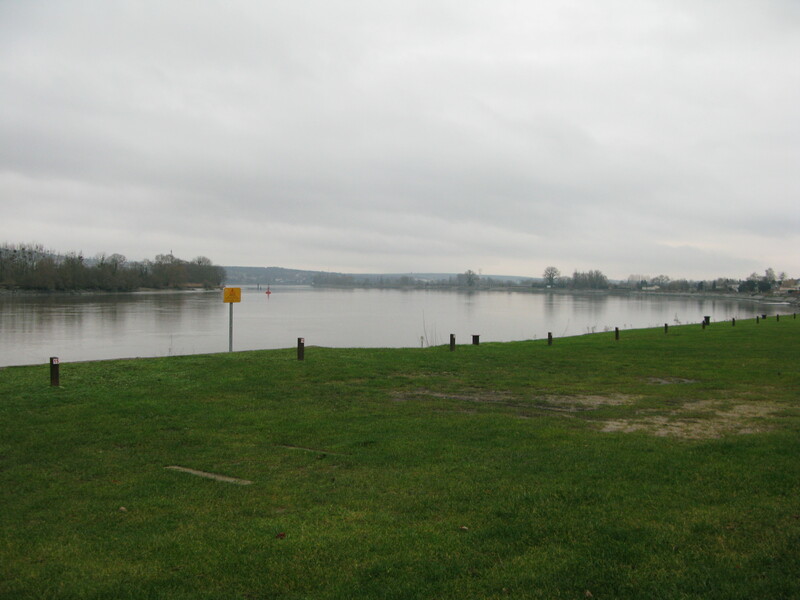 We are a couple of minutes’ walk from the town centre, where all the shops are and where I’ve just been for a walk. There is, of course, a very handy river walk for dogs, so we really don’t want for anything. We had a very quiet night last night at La Mailleraye-sur-Seine and slept until 8 o’clock this morning after watching the first two episodes of The West Wing until 9 o’clock, as we were tired and had an early night. We really enjoyed the programme and look forward to the next episode(s) tonight. 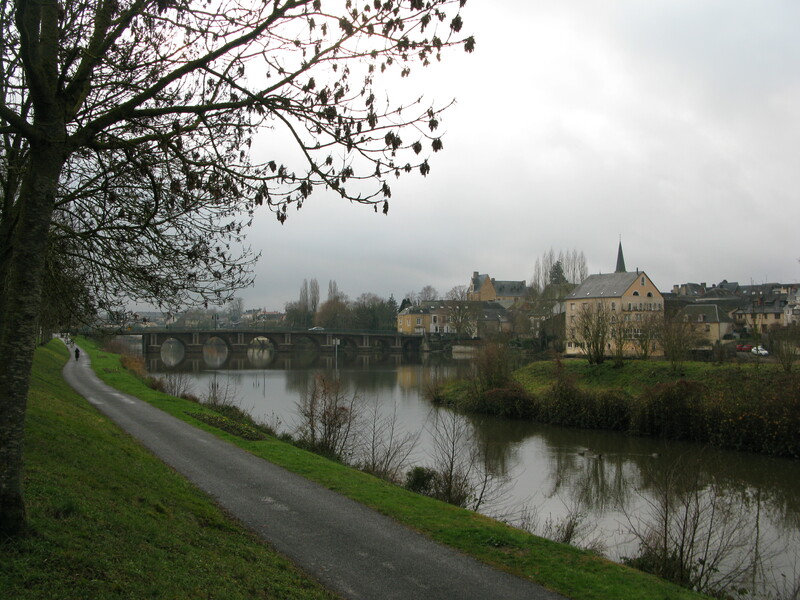 La Suze-sur-Sarthe from riverside walk. 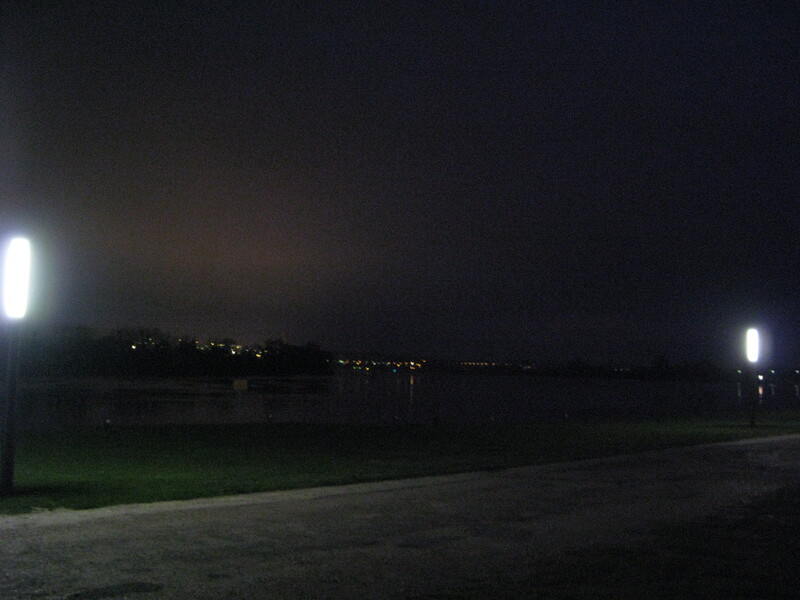 It was still dark when we got up this morning at 8, but the fog had lifted and I took a few pictures of the aire, still illuminated by street lamps, and the opposite side of the river bank. We left again at around 9.15 am and carried on the D913 to Bourgtheroulde-Infreville, where we joined the D438 southwest to Broglie to top up with water using the jetons we bought last time we were here. We had a panic moment when we tried to empty the grey water tank and nothing would come out and Adonis used his plastic tube to check for any blockages, but still nothing would come out. We tried using the plunger on sink and unscrewing the draining hole, but to no avail, so Adonis resorted to unscrewing the big tank cap underneath the van and that did it, except that there was hardly any water in it and we found out that’s what the problem was: not enough grey water in waste tank. We can only assume the outside tap had been left opened the last time we emptied the tank and it had been emptying itself all the time as we used it! Panic over, we carried on our merry way on the D438 past Alenҫon and the D338 to Le Mans, then the D23 to Allonnes and finally here for 2 o’clock. It’s nearly 5 pm now: Adon is fishing, I’m going to crochet for a bit and then cook Spaghetti Bolognese. We weren’t that impressed with those Vietnamese spring rolls last night, as they had more crab than king prawn, and will not be buying them again. One more thing: I navigated all the way through today without taking my eyes off the map and the road and I’m pleased to say we did not get lost or take a wrong turn. Anyway, Homer Simpson was getting on my nerves!!! And Father Christmas came by boat! 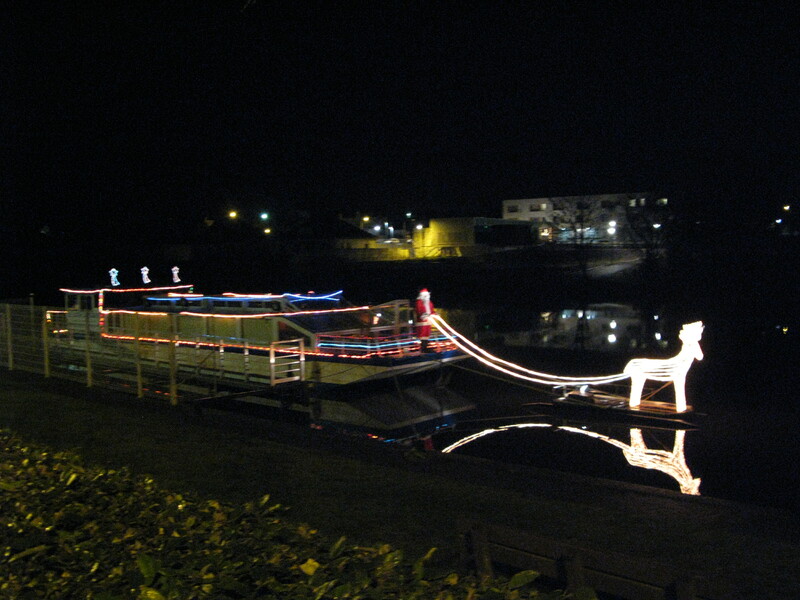 As it is getting dark, I can see the Father Christmas and Rudolf decoration on the boat on the river: Really pretty and original! 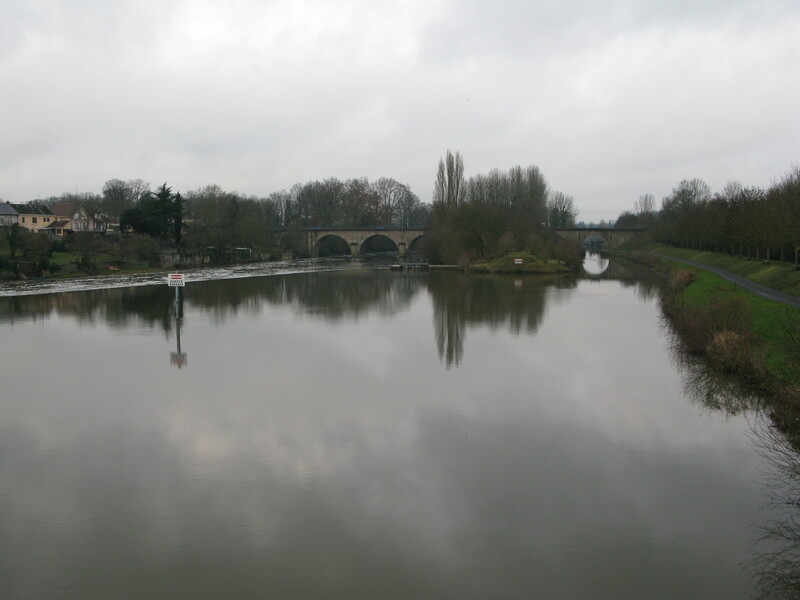 We have found another wonderful aire on the river Seine, just down the road from St Nicolas de Bliquetuit, about 15km west of Rouen, on the D490. 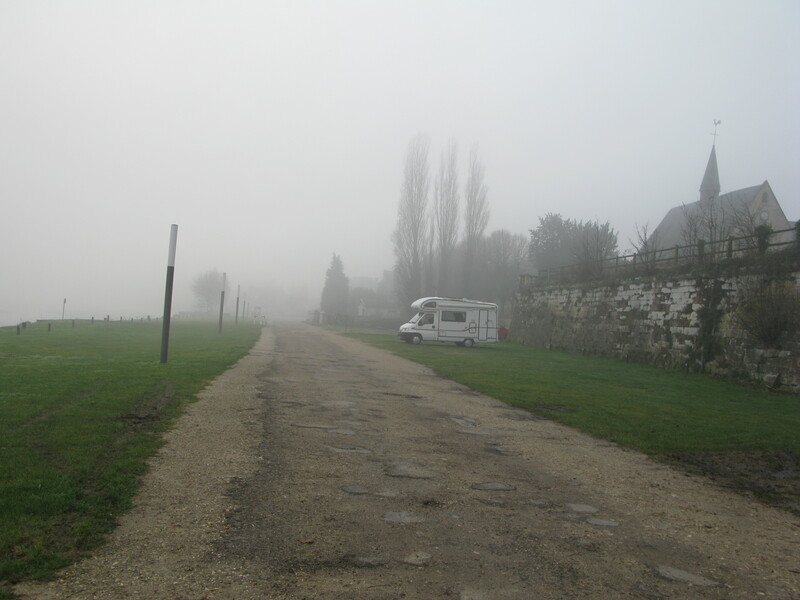 We are parked right by the river, but can hardly see it due to the thick fog. We left home yesterday at 12.45 pm and made it to the Euro Tunnel terminal by 3.15pm. There was hardly anybody there and got on the 4.12 train to Calais. It was dark when we arrived there due to the one hour difference and just headed to the aire at Wissant, a mere 20 minutes down south on the D940, junction 40 off A16. 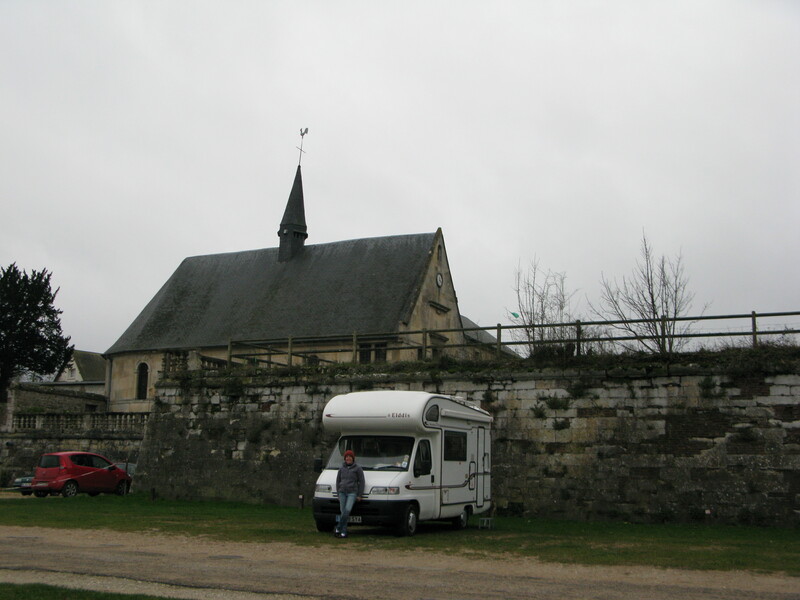 The aire was also nearly empty with just 6 more motorhomes when we arrived, although I counted 9 this morning. Last night I heated up the leftover Christmas dinner, as I was loathe to throw it away and brought everything on the china serving charges we used at home, so it was a nice and easy meal. I’ve just remembered the horrible traffic jam at the Fontwell roundabout near Slindon in West Sussex, as everyone seemed to have decided to go to the races on Boxing day. Luckily for us, we were going in the opposite direction and didn’t get caught in it. We got up soon after 8 this morning and were ready to leave Wissant by 9.15 en route to Auchan hypermarket at Boulogne, as we prefer this to Carrefour in Cité Europe, even though it’s so huge you almost need a compass to find your way through. I was amazed to see the amount of chocolate boxes and jars of foie grass, as this is banned in England. It was a quick shop and after loading van with food and drink, we were ready for departure by 10.45am. We followed the A16 and A28 south as usual as far as Neufchâtel-en-Bray, where we were supposed to take the A29 west at junction 10, except that things didn’t work out quite as planned. As we were following directions given by Homer Simpson on the TomTom, I decided to text Pepo to find out which train to Birmingham he was catching, as the journey the day before had been cancelled and I was a bit worried about his trip. I had already told Adonis we needed junction 10 of the A28 heading west towards Le Havre, so happy with the comforting knowledge that he knew what he was doing plus the instructions from Homer, I totally disconnected from the map and the road while I texted Pepo. Then I heard Adonis saying “this is the junction for A29”, I quickly glanced up and was surprised to see junction 7 and not 10 as agreed. Only a couple of minutes later I heard him say that he didn’t think that was right, as it was signposted to Amiens and Lille, further to the east. I checked the map again and soon I realised he had come off the A28 far too early and we were heading in the wrong direction. The worst thing was that the A29 is a toll road and we had to continue to the next junction (J12, about 15 km away), where we had to get off to approach a ticket booth and pay €1.60 for ticket for a motorhome. Then we proceeded to barrier and inserted ticket in the machine slot, but barrier didn’t lift and kept asking for a credit card. I inserted this and barrier lifted and we turned around. That meant entering the A29 again in the opposite direction and had to take another ticket and pay again when we came off it at J.7 at Neufchatel-en-Bray. Back on the A28 heading west and finally joined the A29 at junction 11 at St Saen with direction to Yvetot and another toll ticket. It was plain sailing from there and made it here for 2.30 pm at last. 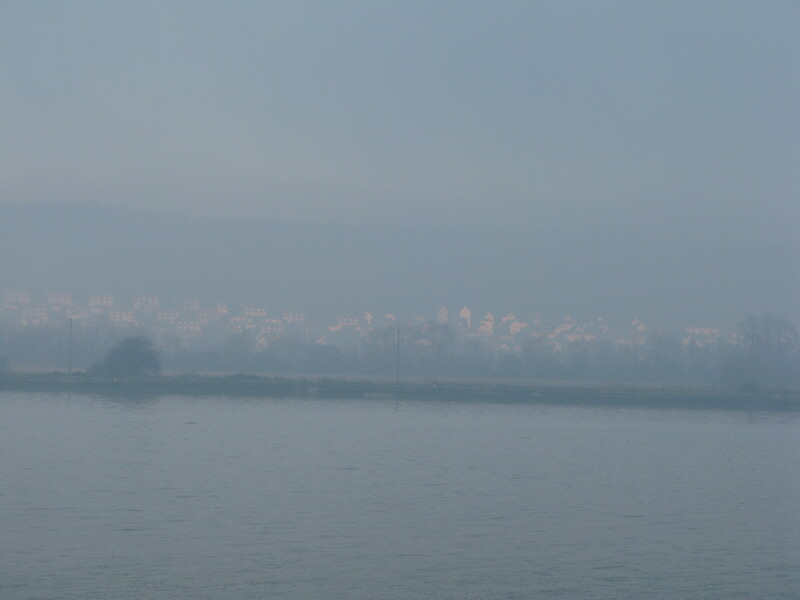 It was strange how the weather changed soon after we headed south from Yvetot, as it turned very foggy the moment we dropped into the valley of the Seine and visibility deteriorated to about 50 metres. We had to slow right down, especially since we were following a heavy lorry with a cargo of sand and dirt and couldn’t overtake. 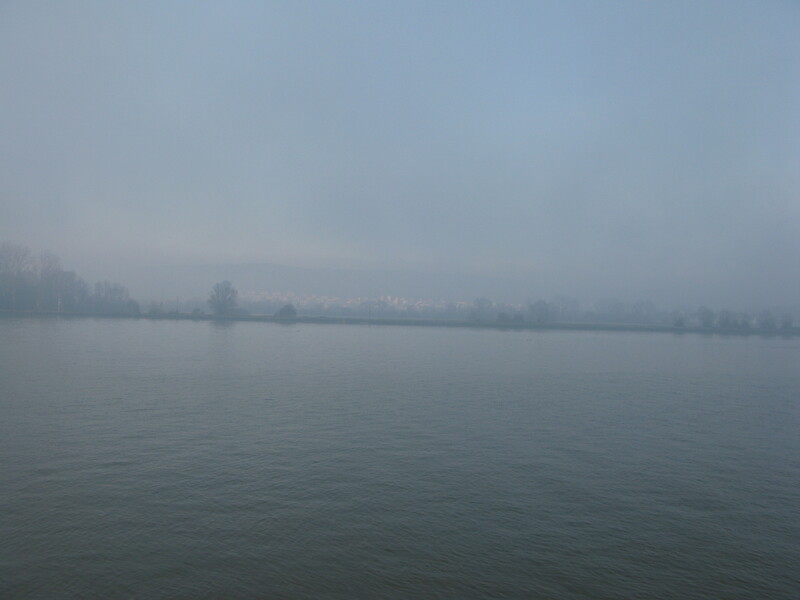 The fog lifted slightly while we were taking Bramble for a walk and I took a few pictures of eerie river bank and town on the opposite side, which we believe to be Le Trait. It’s turned very cold too, so we have the heating on. After walk, I crocheted another square for my scarf while Adonis played chess on his mobile. Now we are enjoying a glass of Chardonnay and are going to heat up some Vietnamese prawn spring rolls and serve them with couscous: another easy meal after spending the morning cooking on Christmas day. Tonight we’ll start watching the first episode of ‘The West Wing’, which Adonis bought for this trip especially. If not too tired, I’ll keep reading ‘Seeing Julia’ by Katherine Owen on my brand new Kindle G3 I got for Christmas. I’ve read 2 chapters so far and I’m really enjoying it: it certainly makes you want to keep on reading. I love the little torch that’s come with the kindle cover, as I can read in bed without disturbing Adonis.